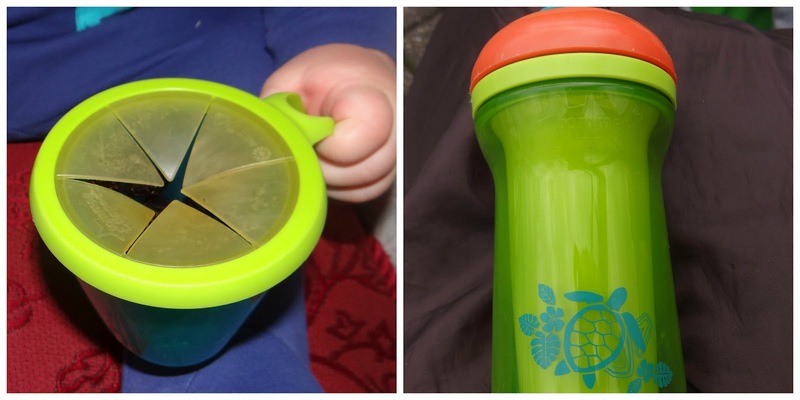 When it comes to toddlers and moving on to beaker cups to provide them with water or juice as an alternative to milk, it can be a mammoth task to find the right one. It took Leo and I various attempts with many a different beakers in order to narrow it down to one that was user friendly for him, and one that he was happy to use. 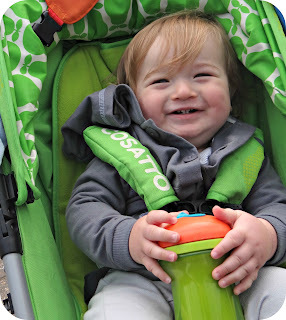 We eventually narrowed it down and found a tippy cup and a sports bottle that Leo was very happy with, and finally our daily dilemma of getting something other than milk into him was solved. Now though Leo is coming up to 15 months old, and he needs to start learning how to use a straw. I already know of babies Leo's age who have mastered this task, but I didn't want to rush him, as ultimately it is only Leo who can decide when he is ready for the next step. Tommee Tippee very kindly sent us their Active Straw Cup to try out, and it seemed like the perfect opportunity to see how Leo got on with a new cup. The Tommee Tippee Active Straw cup retails at £3.99 and comes in 3 different colours. This cup is designed to help babies and toddlers from the age of 12 months learn how to drink through a straw, which may seem like a simple task to you and I, but to them it is a whole new skill. The straw is made out of soft silicone and features a flip lid top so that the straw it's self stays germ free and clean while out and about. The cup is insulated and designed to be non spill and leak free, I have to admit that we can confirm this. We have had no annoying spills or even little leaks, and it has done us proud. After our initial palaver in finding the perfect cup for Leo, I was expecting a little reluctance on his part. And true to form on the initial introduction that is exactly what I got. I presented Leo with his new cup, popped up the straw and handed it too him. Leo point blank refused it and soon threw it to the floor for the first time. I left it and decided to try him again with it the next day, and that was exactly what I did. Leo's attitude seemed to have completely changed and he was now actively attempting to give his new cup a chance. Granted he still thought he had to tip the cup up to get any out, but he was at least trying. Leo did manage to hurt his lip on the pull up lid, but that was just because of the way he was drinking out of the cup. I think he soon learnt from his mistake as he has not done this since. He can now drink out of the straw like a little pro, and the Tomme Tippee Active Straw cup is now our first choice when ever he requires a drink. Not only can Leo drink out of his straw cup but he can even drink out of an everyday straw, I know this as the little monkey decided he wanted some of my drink and succeeded. The snack pot has a very easy to access soft lid, that is so very inviting for little hands to push through and get at the food that is just sitting there ready to be grazed on. The great thing about this snack pot is that when tipped up the soft lid keeps all of the food safely locked away in the pot. The lid is made up of soft individual folds that separate for your toddler to get his hands in, and bring out some of the goodies you stock it up with. The possibilities are endless, you can really put in whatever you like. Fruit, veg or in Leo's case... Cheerios. I was not sure what Leo would do when presented with the snack pot, at first he looked a little puzzled. Then he cried until I got him a few out, and he even had a little cry when he got frustrated. I could see his mind working over time trying to find a solution to the problem that was currently standing between Leo and getting what he wanted. Within minutes Leo was holding the handy handle on the side of he pot and putting his hand into the pot and retrieving the goodies that were once just beyond his reach. 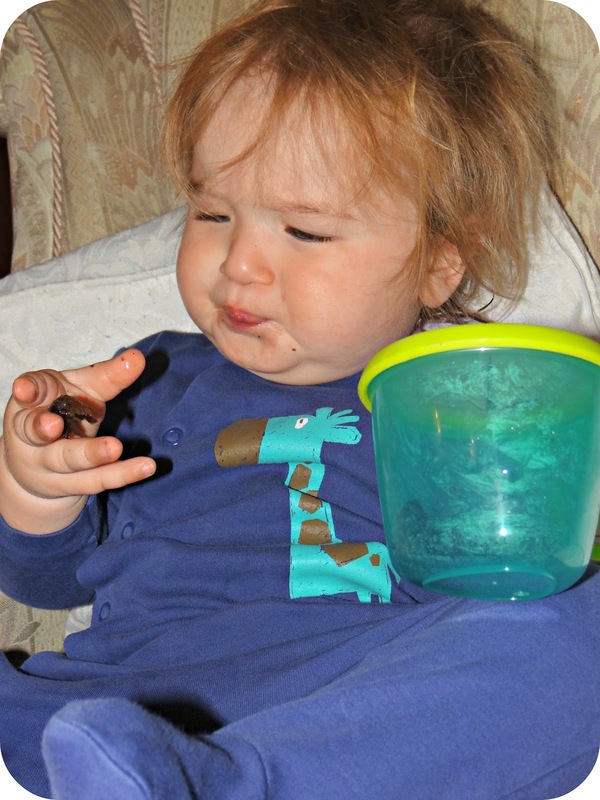 The Snack n Go Pot retails at £4.99 and really is a fab way to encourage your toddler to feed himself independently. 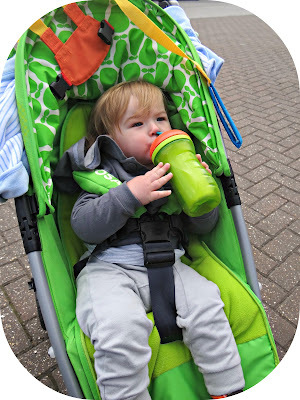 I have found it great taking out and about with us so that he can have a little snack in his pushchair without making the same usual mess that accompanies Leo most days. Of course the Snack n Go Pot can not be there to save us at every turn in the road, and there will be days where there is no stopping Leo making a mess. I mentioned his love for breakfast cereals, mainly Cheerios. 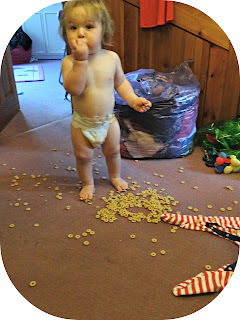 And when Leo's Auntie leaves boxes of cereal lying around, we really are asking for trouble. I was on my hands and knees laying out his baby grow to get him ready for bed, when I suddenly hear the bounding of little feet. Size 4/12 H feet to be precise. In the next instance I hear the rush of something falling to the floor. I turned my head to find Leo pouring Cheerios every where. With Leo's desired result accomplished he began shovel them into his mouth, his eyes growing at the thought. 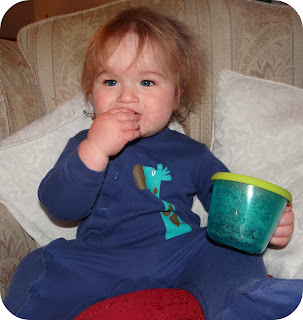 All my little monster's tactics aside, we got on really well with both of these fab Tommee Tippee products and I am pleased to give them a big thumbs up. As you can see, Leo has really got the nack of them both now. Disclaimer: I was sent the Tommee Tippee Active Straw Cup and Snack n Go Pot for the purpose of this review. However all views and opinions are completely honest and my own.